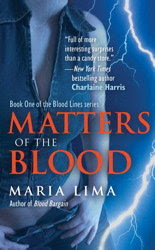 With the upcoming third release in the Blood Lines series by Maria Lima, Juno/Pocket Books are re-launching the series starting this month with Matters of the Blood. Now is your chance to read Matters of the Blood and Blood Bargain before the release of Blood Kin in October (2009). I picked up Matters of the Blood on last weeks book store run. :) I am looking forward to reading it. This sounds good, a bit murder, a bit mystery. This is a new author for me, I am going to add it to my wish list. Looking forward to this one when it gets released!